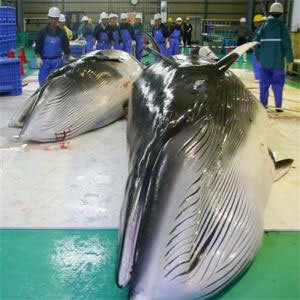 This morning I awakened to the new that the Japanese have begun whaling again. The Dall’s porpoises and minke whales are probably dying this moment as I type. This is a quick way to take action post. 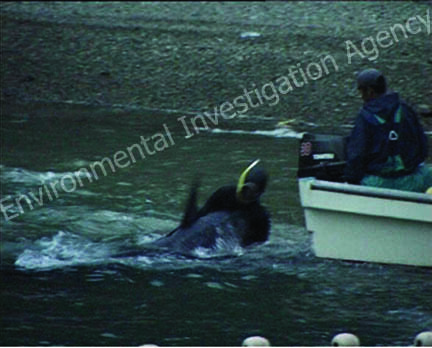 We need to tell the Prime Minister of Japan that the killing of cetaceans is illegal and must stop. It is time to let go of the old traditions that we know today are wrong. Follow this Link and send a message to Naoto Kan. Tell him we want to support Japan, but they need to stop whaling it is illegal and wrong. Sea Shepherd’s, “News Today” page featured a post,”No Welfare for Whaler’s This Year”. In it they address the fact that Japan has undergone a huge disaster. I think the Sea Shepherd’s sum how the world should respond to dishonorable whalers, who are now killing whales. “There have been a few critics who have been advising us to lay off Japan because of the recent disasters. The point is that Sea Shepherd interventions are not targeting the Japanese people. We are addressing unlawful activities – whale poachers in an area far from Japan, the Southern Ocean Whale Sanctuary, where whales are supposedly protected by law. WE MUST BE THE VOICE FOR THE PEOPLE OF THE SEA! WE HAVE STRENGTH IN NUMBERS WE MUST MOBILIZE INTO ACTION NOW!! by ending massacre of Dolphins in Taiji. Show the world Japan is not a backward country but evolved and civilized. Follow the link below and leave your message for Prime Minister Naoto Kan. Each message sent must be logged by Japanese government and an answer sent out so every comment counts! I was moved to write this short piece after reading the Sea Shepherd Cove Guardians blog. 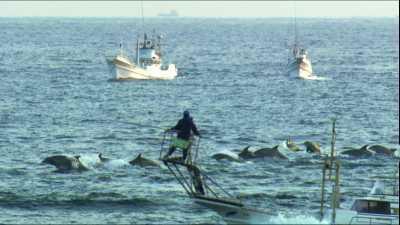 They are so strong to be able to watch what is occurring in Taiji right now as I write this on February 20, 2011. I can’t imagine going to sleep knowing that in the morning you might have to watch 100’s of dolphins, their babies, and children brutally murdered by the cold-hearted Japanese Fisherman of Taiji. Please read their blog and support them anyway you can. The pilot whale is the most gentle and trusting of the Cetaceans and yet the Faeroe Islanders slaughter these gentle souls by the 100’s. Each summer pilot whale migrate past the Faroe Islands. The unlucky pods are spotted and then driven into shallow coves where the local people slaughter the whales. “Grindadráp” is the name used for this traditional killing. This is not commercial whaling, in fact they are non-commercial and are organized on a community level; anyone can participate. The hunters first surround the pilot whales with a wide semicircle of boats. The boats then drive the pilot whales slowly into a bay or to the bottom of a fjord. Once the whales are stranded the men rush into the water, secure the whales by putting a large hook in their sensitive blow holes and then begin the killing. Don’t the Faeroe Islanders realize this is 2011. Today the meat is known to be toxic, and unhealthy for the entire community. In addition, cetaceans are very intelligent creatures, with complex social families and systems of communication. We must urge the Faorese government that it is in their best interests to end the “grindadráp”. 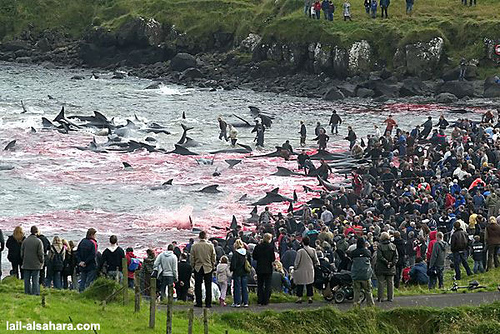 Contact The Prime Minister of The Faroe Islands Office and the Faroes Board of Tourism. Urge them to stop killing pilot whales before it is too late. Remind them that the meat is tainted with mercury. Let them know that we you will boycott travel to the Faroe Islands. In addition, boycott all cold water seafood and products originating from the Faroes until they stop killing, and selling the flesh of cetaceans. Please take the time to email, call, or even write a hand written letter. It will take more time as The Faroe Government does not have easy contact information. We know that is a way to silence our comments, so let’s take the extra time. If you wish to write to the Danish Prime Minister’s Office, we suggest that you send an e-mail to the main e-mail address;stm@stm.dk. Your mail will then be forwarded to the relevant area or employee.